Julian Best, and his brother Keith, served on HMS Gambia for the 1955 to 1956 commission. Keith and Julian dd serve together on HMS Gambia but oddly, I can't find Keith Best in the list of crewmen in the 1995-56 Commission Book. 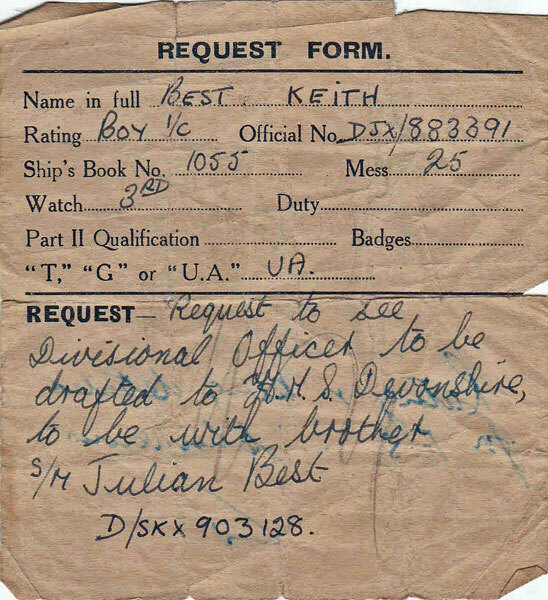 I now know why this is; Keith's full name was John Keith Best but he was invariably known as Keith by people who knew him. 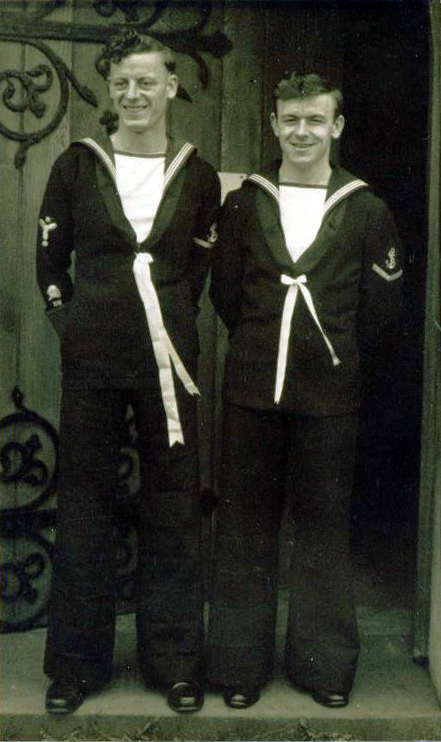 Julian served on several other ships during his time in the Royal Navy. His first was Devonshire, the officer cadet training cruiser, then Triumph, the carrier, that took over those duties from Devonshire, Enard Bay, Mounts Bay, Alaunia, Orion, Barrage, ( coal burner, boom defence, that Julaian wrote was "hard work!!" and "that's when I discovered why they called us stokers! !," Howe, Barbastell ( another coal burner!! Gambia with his brother, Keith on the same commission. Then a "horrible" draft to the WRNS camp St Budeaux, just across the water from HMS Drake, "nine months tending the boilers! Someone in Drake must have thought that I was on to a cushy number, so they bunged me on a plane and sent out to the Med to join Girdleness, the rockets they sent up from that ship put all our Guy Fawkes celibrations to shame!!" Julian spent most of that commission on the water evaporators, and as the FWT (Fresh Water Tankie). He says that" I was the one who turned the water off to the Somalie showers when they went down for a wash!!!" 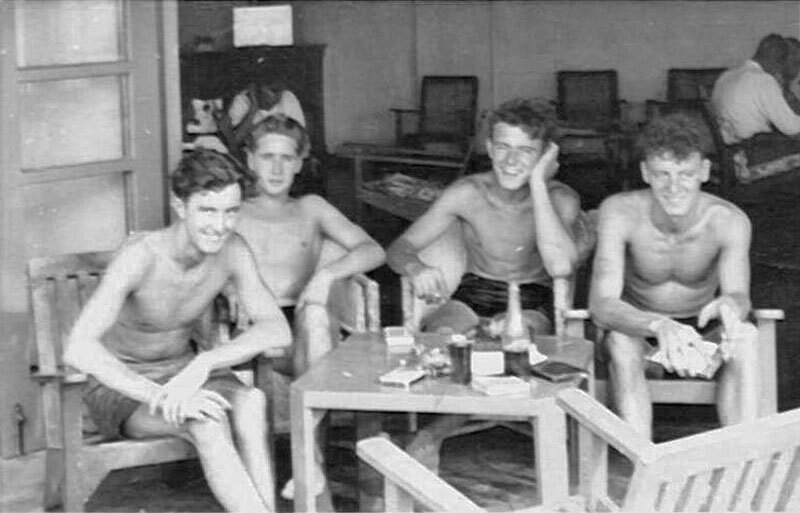 Julian explains how he and his brother Keith met on HMs Gambia. "Well, the day we departed from Guzz, I was off watch, and sitting down on the mess, 24 mess, when I heard this clatter clatter of feet on the ladder behind me, I looked round and lo and behold there stood Keith, I said 'What the f*** are you doing here?' 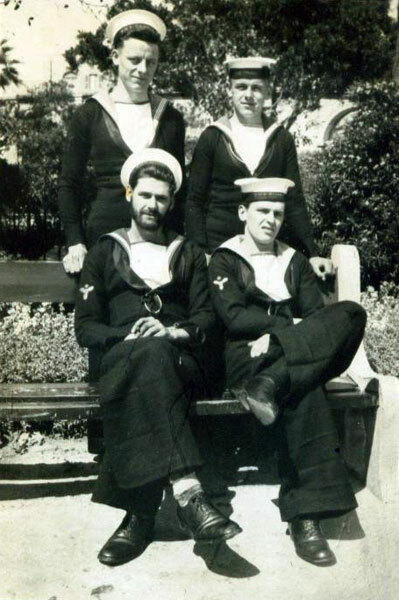 'Well, I done the usual request to join Gambia, as you were on her, and, it was granted, so here I am, twenty minutes before we sail' As it happened, he had made a request to join the cadet training cruiser HMS Devonshire, a few years previous to that, but it wasn't granted. Left to right back row: Julian Best, Keith Best, front row left to right Scouse McCarten and Brum Harris. Julian is the last survivor from this quartet. There is a M(E) W. H. McCarten in the 1995-56 Commission Book. There are several Harris's in the list among them M(E) B. G. Harris, M(E) R. Harris, and L.M. (E) J. A. Harris. I don't think the man pictured is the last named or there would have been an "L" under the propeller insignia on his arm. Julian informs me that I am mistaken is saying this, he never saw one of the "L"'s - he should know, he was there, I was not. Julian Best and the late Keith Best with others, so who are the other two? Julian can't remember them. This is a much later photograph of Julian and Keith Best. This was taken in April 1962 at Julian's wedding and was used on Bill's original site by permision of Sheila Best, Keith's widow. HMS Gambia returned to Devonport Dockyard on March 1, 1956. Before ships arrived home, invitations were sent to parents and next of kin to greet the crew. 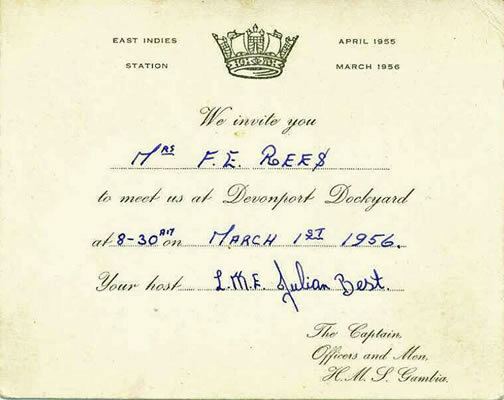 This invite was to Mrs Rees, mother of Julian Best. Julian also sent Bill the newspaper clipping. 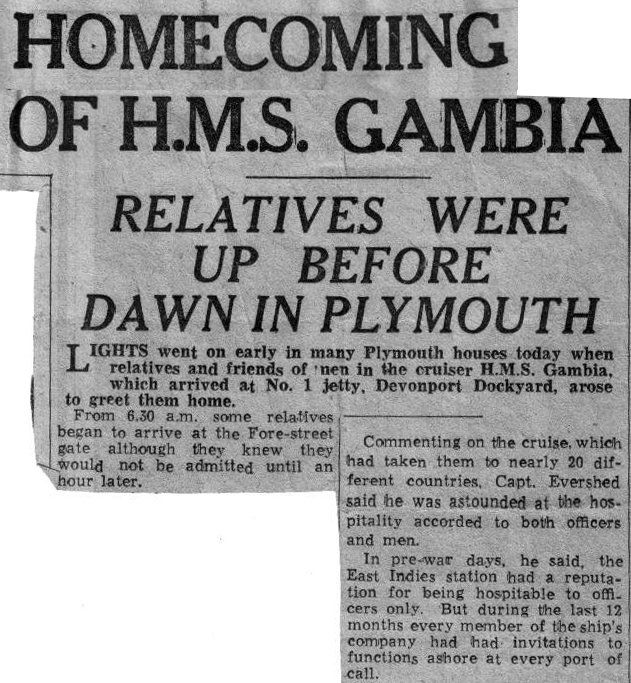 Lights went on early in many Plymouth houses today when relatives and friends of men in the cruiser H.M.S. Gambia, which arrived No. 1 jetty. 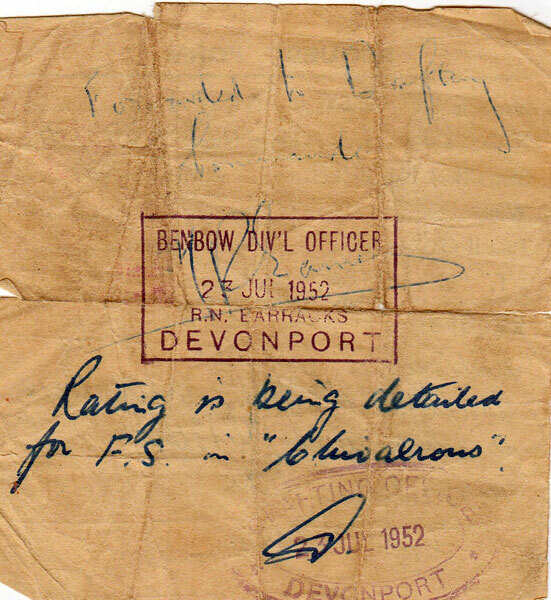 Devonport Dockyard, arose to greet them home. From 6.30 a.m. some relatives began to arrive at the Fore-street gate although they knew they would not be admitted until an hour later. Commenting on the cruise, which had taken them to nearly 20 different countries, Capt. Evershed said he was astounded at the hospitality accorded to both officers and men. In pre-war days, he said, the East Indies Station had a reputation for being hospitable to officers only. But during the last 12 months every member of the ship's company had had invitations to functions ashore at every port of call. Velly Melly Klistmas, my sendee you. 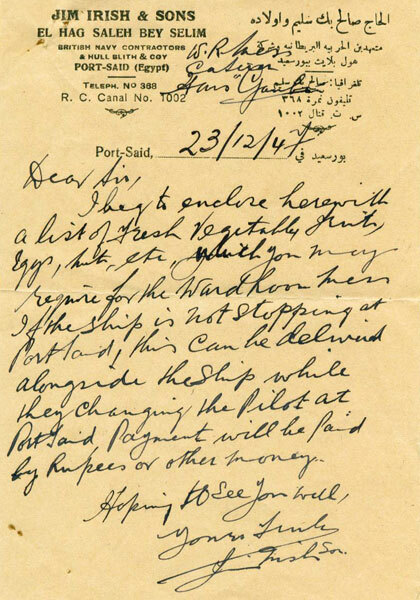 The provisions list that Julain sent is dated December 23, 1947 and is from Jim Irish and Sons, El Hag Saleh Bey Selim [which is Turkish for Mr. Saleh Selim El Hage], British Navy Contractors, Hull Blith & Coy, Port Said (Egypt), Teleph. No. 368, R. C. Canal, No. 1002. 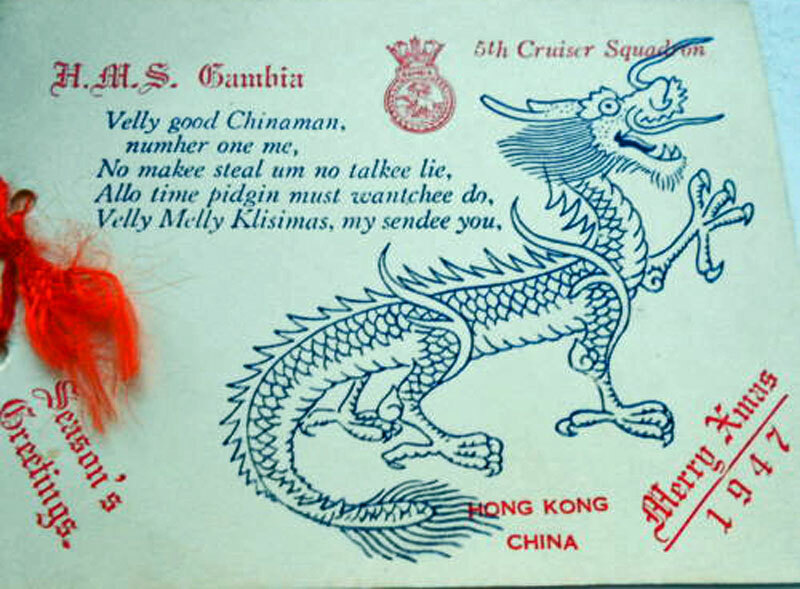 It is addressed to the Ward Room Mess, HMS Gambia. 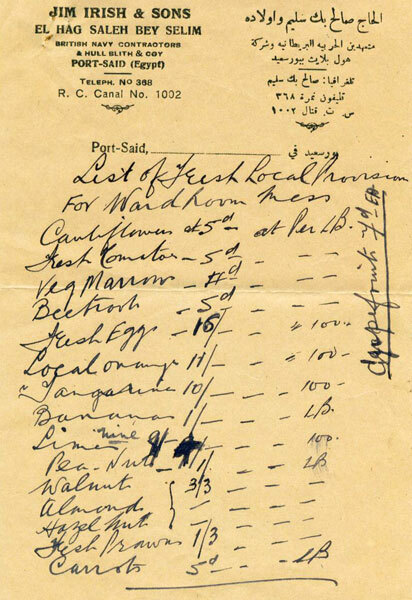 I beg to enclose a list of fresh vegetables, fruits, eggs, nuts, etc., which you may require for the Ward Room mess. If the ship is not stopping at Port Said, this can be delivered alongside the ship while they changing the pilot at port Said.Pyment will be paid by Rupees or other money. I got a little story for you, and it's true. About three months ago, I was down in the local builders yard, and as I walked from my car towards the showroom, I just happened to say to a lady, who was standing by the doorway "Nice bit of weather we are having at last" she answered me, and then asked about the car I was driving, as it is a 1977 Vauxhall Cavaliar, in very, very nice gleaming Polar White, so we chatted there, and I asked her where she was from, I can't remember the place she mentioned, somewhere in England, but I said it's your accent that made me ask, "Oh," she said, "we spent most of our lives living in Sri Lanka, or Ceylon as it was then", so I said "What part? ", "Oh not a very well know place really, Trincomalee", "I've been there" I said, and with that her husband appeard from in the shop, so she told him that this gentleman has been to Trinco, "Holiday is it?" he said, "No" I said," I was in the Royal Navy, and we were stationed in Trinco in 55/56", He raised his eyebrows and said "DON'T TELL ME YOU WAS ON H.M.S.GAMBIA" "I sure was" I said, well we spent an hour chatting, he said that he was a supply officer for the R N, AND SUPPLIED stores to C48, during the conversation, it had to come out about the rest camp DYATALAWA ( CAN'T SPELL THAT) [it's actually Diyatalawa] I supplied them with provisions too, he said, One never knows who one will meet, I was chuffed to bits, and I think they were also. About 20 years ago, I was up in Scotland, Keith lived up there, we were half way up the Royal Mile heading for the castle but had stopped as the women wanted to go in to see some childrens toy museum,Keith and I stood there on the side, when a guy the other side of the road shouted across, "What are you two Welsh ****** doing up here, it's to early for the rugby", I didn't know him but he was on the same mess as Keith on Gambia, fancy him recognizing us after all those years.